Time now to delve into Burford Capital (BUR), a £266m litigation-financing business that joined my portfolio following some very scant research. Litigation funding was a nascent, fast-growing industry. At the time, BUR said business was “booming”. 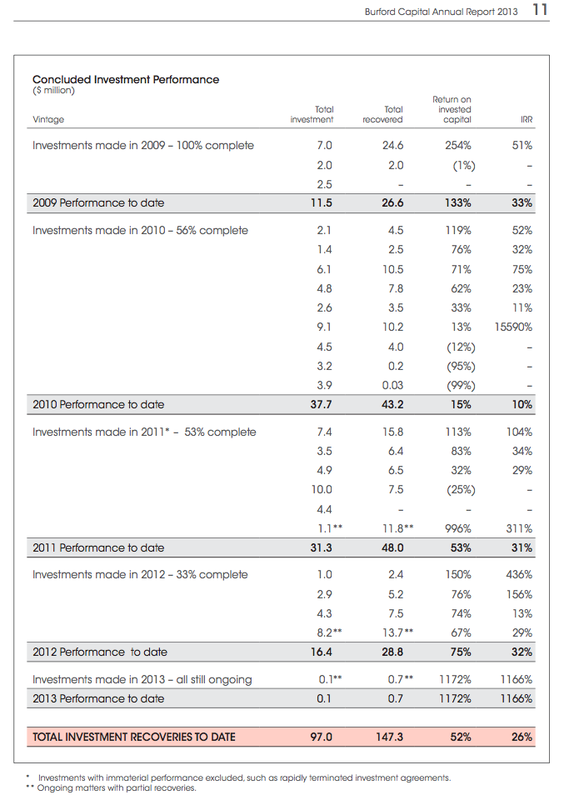 The firm was claiming fantastic returns on invested capital (some 70%!). I assumed BUR’s operations would not be affected by recessions or market crashes. A corporate reorganisation had aligned the main executives with shareholders. The shares traded at book value. Good future progress might see the shares re-rated well above book value. A fund managed by ace investor Neil Woodford owned 45%. It wasn’t in-depth stuff and luckily I’ve managed to enjoy a reasonable return. I bought between November 2012 and February 2013 at an average of 101p, and I then sold 51% of my holding at 120p between October 2013 and January 2014. The recent market price is 130p. …why the company’s fantastic returns on invested capital haven’t translated into fantastic share-price growth! Burford Capital (BUR) claims to be the world’s largest provider of investment capital for litigation finance. The firm started out by raising $131m when it joined AIM during 2009 and shareholders pumped in an extra $172m one year later. A retail bond issued last July provided a further $150m. The money BUR raised goes towards funding parties involved in legal disputes within the States, or parties involved in international arbitration matters. Traditionally BUR would effectively pay a client’s legal fees in return for a proportion of any subsequent settlement or damages. However, the financing arrangements BUR now employs are somewhat more complex — although profits are still dependent on successful settlements and court verdicts. Up to June 2014, BUR had either invested, or had committed to invest, some $423m in 56 different legal disputes. Of those, 26 have been concluded and produced a total $67m return on the original $107m invested — a 63% gain. The Internal Rate of Return figure of 26% down at the bottom certainly catches the eye. During 2012 BUR purchased a UK legal expenses insurer for $27m, which is now effectively in run-off following new legislation implemented in 2013. Notably, this subsidiary has already generated total profits that exceed its $27m cost! Also in 2012 BUR conducted a reorganisation, whereby the firm brought its litigation investment advisers in-house by issuing them with shares worth $38m. The revised corporate structure was primarily to give US clients favourable taxation benefits and thus capture further business. However, I liked the fact the-rejig also curtailed the investment managers’ performance fees and any non-BUR work they had planned to perform. Despite BUR claiming superb gains on its concluded investments, as well as that 26% IRR, the shares have never been a sparkling performer. The price at flotation more than five years ago was 100p… and it’s now 130p. BUR’s accounting is not the easiest to understand and I will spare you a lot of the details. So here’s my summary of the group’s headline figures since the flotation (BUR reports in US Dollars). The most important measure of progress for me is net asset value (NAV), which reflects the value of BUR’s investment ‘portfolio’ plus the cash yet to be invested. Following the second fund-raising in 2010, BUR’s NAV has advanced $57m, or 19%, to $353m. Account for dividends paid out of $35m, and the total NAV gain is $92m, or 31%. Achieved during three-and-a-half years, that 31% gain translates into a compound average growth rate of 8% — which is hardly close to the 60%-plus investment gains and the 26% IRR the firm has quoted. So why this seemingly pedestrian NAV growth rate? There are two points to consider. How could I miss the hefty costs? First, employing lawyers is expensive. In fact, since the end of 2010, BUR’s shareholders have had to absorb total litigation-related staff costs and other expenses of $42m. That’s a hefty amount when total litigation gains and related income for the same period came to $107m. I must admit, it took me a while to realise BUR’s operating costs were so significant. Second, the cash shareholders have handed to BUR was not invested all in one go. In fact, some of it may never have been invested at all. At the last count, $77m was languishing on the balance sheet and past results have always shown at least $68m in the bank. Now, a lot of this cash will be committed to future investments — so it’s ready and waiting for clients as and when they need the money. But even so, this ‘committed’ cash is earning next-to-nothing in the bank and not doing NAV growth any favours. 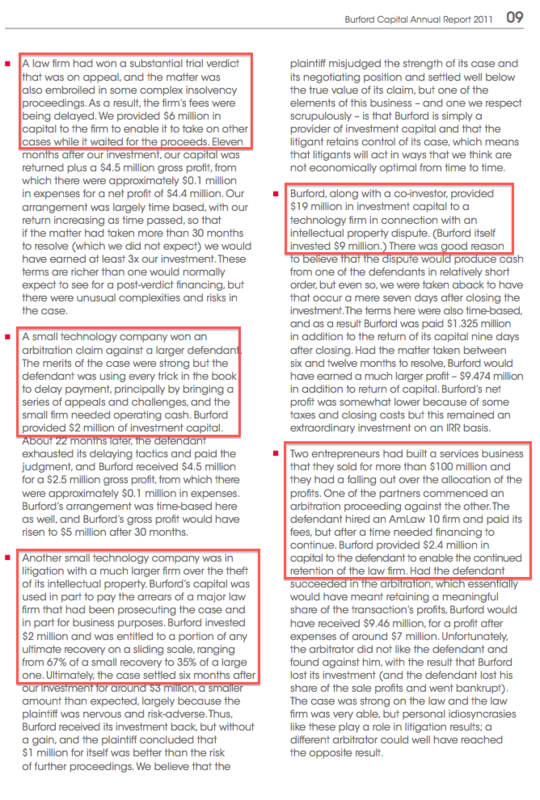 So the drip-feed nature of BUR’s investments, plus the material amounts of ‘spare’ cash on standby, all mean those fantastic litigation returns will sadly not be enjoyed on BUR’s entire NAV. So just what level of returns has BUR earned from litigation? I’ve studied the accounts and I believe this to be my best — and most generous — estimate. True, my own IRR skills are not great, and the presence of both positive and negative net cash movements is not helpful either. But for what it’s worth, my calculations point to an annualised return of 18% from a net total investment of $161m. Not bad. 192p per share tangible NAV by the end of 2018? BUR’s latest book value was $353m, although subtracting intangibles gives $349m and therefore a tangible NAV of 113p per share at £1:$1.51. Buyers at today’s 130p are thus paying a premium to book for BUR’s future growth. Let’s see how that growth could look. We’ve just seen above how BUR has essentially transformed cash of $161m into a litigation portfolio with a fair value of $269m during the last four-and-a-half years. So…what if BUR could repeat that 66% gain with its current balance sheet in the next four-and-a-half years? But let’s not forget BUR’s costs! Litigation-related expenses are currently running at almost $13m a year, while the bond issue will pay bondholders a lucrative 6.5% or nearly $10m a year. Combined over four-and-a-half years, total costs could then come to a mighty $101m. Subtract that $101m cost from my estimated $320m gain and tangible NAV might advance by $219m to $568m by the end of 2018. Then assume £1 still buys $1.51, and tangible NAV per share at that point would equal 184p. The average annual return from 130p would therefore be 8.0%. As a bonus, we also have future ‘run-off’ profits from Burford’s insurance business. Income there was $10m in 2013 and the accounting ‘useful life’ of the assets purchased extends to the end of 2016. As such, I reckon a further $25m of insurance earnings could be added to tangible NAV before the run-off runs dry. That would take my sums to 192p per share and the potential annualised return to 9.1%. A major downside to this investment is the limited information on BUR’s key management. You see, BUR’s official directors are all non-execs and will have no real bearing on the group’s underlying returns. Instead, the important people here are Christopher Bogart (chief executive) and Jonathan Molot (chief investment officer). But Messrs Bogart and Molot are not full board members, so I’m very irritated in particular by their remuneration details not being disclosed in the annual report. I mean, there’s no way of ever knowing whether these managers are taking shareholders for a ride with their fees. Even the ordinary shareholdings of the two lead executives (and for that matter, Neil Woodford and all the other 3%-plus disclosable investors) are not revealed in BUR’s annual reports, which is very poor form. Ploughing through past RNSs indicates both executives continue to own a £16m/6% stake each, although those shareholdings were created following the aforementioned reorganisation. True, Messrs Bogart and Molot founded BUR, so I am pleased there is some entrepreneurial zest in the ranks. But the pair’s published track record of litigation investment success extends only to 2009 and BUR’s flotation. Overall, this is not the best of executive situations I’m currently invested in. 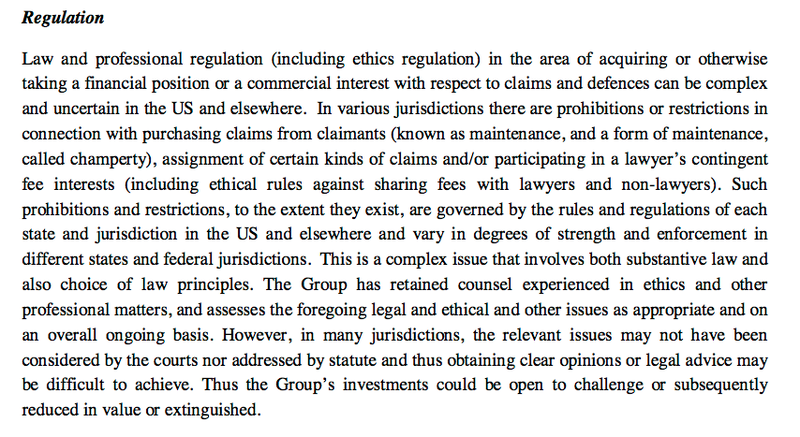 Something to go wrong here concerns the rules surrounding US litigation funding. I suppose they could suddenly change for the worse. That warning may be too cautious of course. After all, BUR has been conducting litigation investments for more than five years right under the noses of US law courts… and there have been no adverse regulatory developments so far. If anything, growing demand for litigation funding — as evidenced by BUR’s expansion and others joining the sector — could mean the regulations are eventually clarified and some of the present doubts disappear. I spent a good two days looking at BUR’s accounts to understand its progress and to judge its litigation returns for myself. Further analysis should now be more straightforward of course, but I must admit I prefer looking at the simpler accounts of, say, City of London Investment or Mountview Estates, within my portfolio. The best-case conclusion I’ve reached is that BUR’s future returns — at least from an NAV perspective — are likely to be in the high single-digits from 130p. 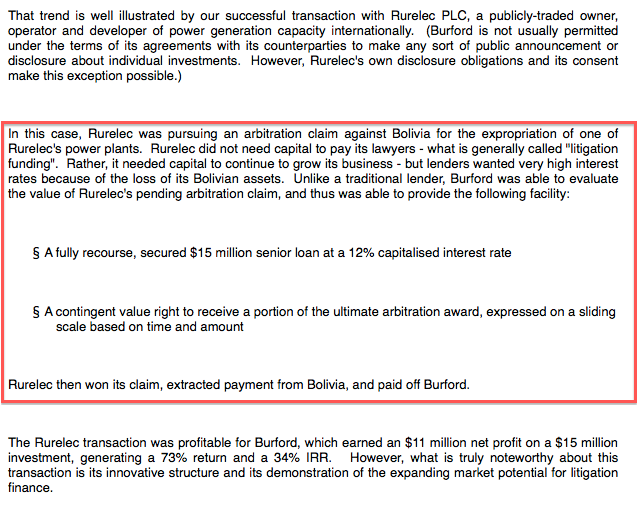 True, I may have underestimated BUR’s skills because plenty of its investment cases have yet to be concluded. However, I note the wider sector is attracting greater capital that could diminish future returns. And I suspect those chunky operating costs will increase as BUR takes on more cases. I can’t really fault management’s explanations on BUR’s progress, and the executive shareholdings do provide some comfort. But the lack of various disclosures in the annual report is a definite black mark. I suppose that is what you get when you venture offshore and invest in a Guernsey-registered investment vehicle. All told, I am minded to keep my BUR holding for now, but it’s not my favourite portfolio member and I know there are alternative shares out there where I’d feel a bit more comfortable. I think if BUR shares rally and I locate a suitable buying opportunity elsewhere, a switch could be in order. Disclosure: Maynard owns shares in Burford Capital. This entry was posted in Burford Capital, My Shares and tagged BUR, Burford Capital on January 23, 2015 by Maynard Paton. This is just to say I sold all my BUR shares during February 2015 at 136p. As you may have gathered, I was not enamoured with so much of the litigation profits being absorbed by operating costs. Plus, the group’s disclosures were not great and the potential upside (when I sold) was about 7-8% a year — and I am not sure whether I was being a bit generous with that projection as well. Taking on extra debt adds a bit more of a risk to this share, too. Anyway, I have sold and now have cash to invest in a much more straightforward operation where the upside may be somewhat higher.